De indulto – I komu to przeszkadzało? About a week ago the word spread all over tradInternet about an indult issued by the Papal Commisssion Ecclesia Dei for St. Peter’s Society allowing them to celebrate Holy Week according to liturgical books from before unfortunate reforms of Pius XII. 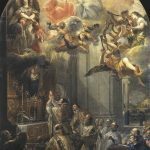 Recently official confirmation of the news have been issued, yet only in a form of announcements given in the churches administered by FSSP priests. Although the permit is time-limited (ad experimentum for three years) and is restricted to the Fraternity only, still it’s a huge step forward. A step I didn’t expect to be made so quickly, despite the visible growth of intrest in ancient liturgical forms. 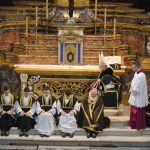 I didn’t comment on the issue before more details were published, as such a decision raises questions stemming from the very characteristics of the rite. It seems, though, that there is no point in waiting for official and public comments on the part of the Fraternity, at least I was told so. The only thing we can do now is to listen to updates from communities where FSSP priests serve. From the questions which has been raised before, at least one has already been answered in a way that could have been foreseen earlier: the permit applies to the whole Holy Week, including Palm Sunday. Unfortunately, it is quite unlikely that in the text of the indult there is even a slightest reference to the Eve of Pentecost, which would appear as a strange inconsequence. Is it possible that the Fraternity forgot about the issue when they were writing their request to Rome? The second issue is the controversial (for some politcorrectly frenzied people) prayer for Jews. As a bulletin of one of the American parishes of FSSP says, the Pontifical Commission has asked that we use the Prayer for the Jews on Good Friday published by Pope Benedict XVI for all those using the 1962 Liturgy. Is the expression „has asked” a quote and, therefore, it should be understood literally, thus not binding, or maybe a proper reference in the indult sounds more categoric or even is a condition sine qua non? For now we don’t know it and if there are no official comments, we will have to wait till Good Friday to receive the answer. Reality, of course, will verify everything, as it always does, so we can hope that, even despite possible pressure on the part of Vatican, the fidelity to a beautiful and ancient prayer will triumph, not to a prayer being a novelty concoted as a result of the pressure of Jewish lobbists and, unfortunately, weak attitude of Benedict XVI. From the information we have received it stems that the last alteration is a change in the time of liturgy (it will be celebrated in the evening), whereas all other elements are to remain the same. It creates a weird situation, as certain celebrations and rubrics of Holy Week will be different to those followed throughout the rest of the liturgical year. We can say, with a pinch of salt, that Holy Week will be celebrated in the Super Extraordinary From of the Roman Rite. This contradiction justifies the following question: should we, in this situation, expect a more widespread abandoning of the Missal of John XIII or even a part of reforms conducted under Pius XII. This issue, however, is to be dealt with in a rather distant future and now it’s still too early to elaborate on it. Still, undoubtedly, the door has been open and the shoe in it will not allow to close it again. Will it result in a revision of certain reforms which have been conducted since the Times of Pius XII and in a return to older forms? Indeed, if we can use folded chasubles during Holy Week, why shouldn’t we use them on other penitential days during the year? We will get to know the end of this story in the future which now seems more bright, thanks to the indult, and allows us to hope that more and more widespread desire to return to older forms wrongly abandoned in 50s and 60s will be noticed and inculded in the mainstream movement for liturgical renewal. Currently it exists on its peripheries, contrary to present regulations, yet faithful to the spirit of the liturgy. 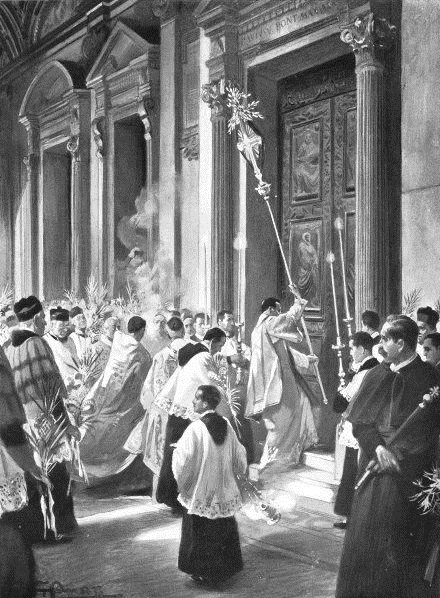 It is absolutely not the case of many aspects of post-conciliar liturgy: its foundations are legal and formally validated, yet contradicting logic and liturgical tradition of the Latin Church.